For years, I have worked on crow pose. And for years, it has remained a mystery. After a bad fall on to my right wrist, pain became part of the equation, taking the pose off the table for me for months at a time. But when my wrist is feeling good, there have been months when it has seemed to be right around the corner and others when it’s become a mirage in the desert. Being thisclose to finding crow has been a valuable teacher. 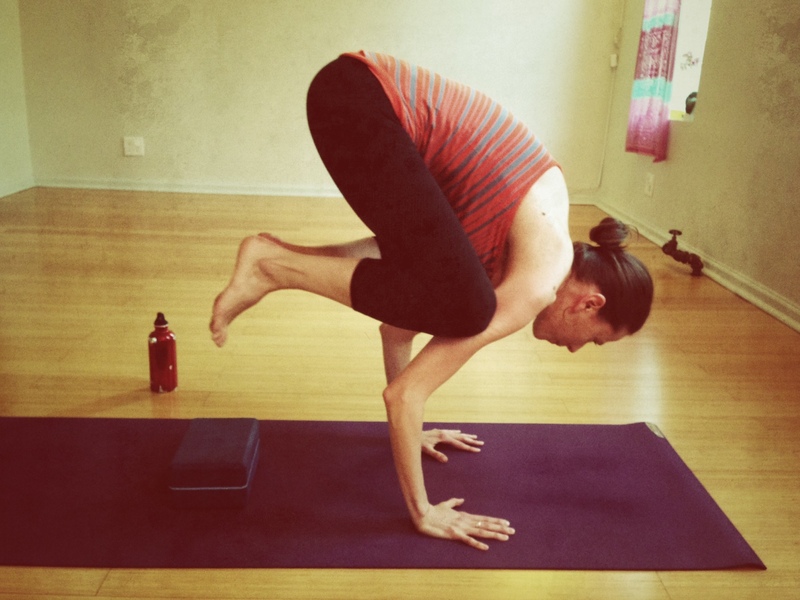 Working on crow — finding the actions and the strength that the pose requires — has also helped me build a better plank pose. It has helped me find my abdominal muscles over and over again. It has taught me how to ground down into my hands to lift away from the mat. I have learned how to take better care of my wrists. And that has carried over into my entire practice. But crow’s biggest impact has been on my mind. Being thisclose teaches me patience. There are days when I would love to skip ahead to the part where I can already do the pose. And there are days when I think I should be able to do the pose by now. But it simply doesn’t work that way. So I work to be patient and trust the process. I have to trust that I am learning how to do this pose each and every time, no matter how close I come. And working on crow encourages me to continue to tinker and play with things because who knows what instruction or key action will help me put the pieces together. 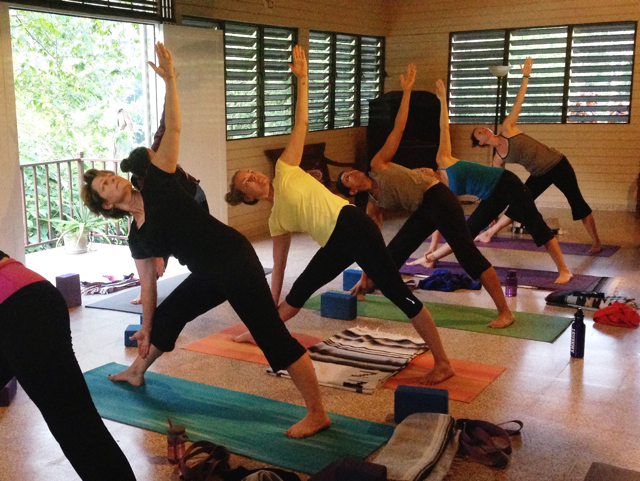 Some poses come easily to us — our bodies just seem to understand how to do them without much prodding. Others do not. How we work with this second category of poses and how we work toward them is rarely linear. Every time a teacher tells the class to move into crow pose, I remind myself that my practice does not look like anyone else’s. Faced with inconsistent results, I have learned the importance of the consistency of trying. So I climb up on my block, find the key actions, and start to lift up as I move my weight forward. Because who knows? Today could be the day. Why Shoulderstand is So Good for You! Before I go into the benefits or shoulderstand, let me just say this: shoulderstand was one of those poses that when it came up in class (and 15 years ago it always came up in class), I would feel the dread overtake me. It never felt good, I struggled to keep myself up without all pressure going into my wrists, and oftentimes my back would seize up after I came out of the pose. I would try everything – blankets, belts, bolsters- and it never felt good. But, like a good student, I continued to practice and finally found a way that made shoulderstand feel good. So, all that is to say – I get it. I understand if you feel like shoulderstand is not all it’s cracked up to be. But the benefits–well, they’re undeniable. First off, shoulderstand is an inversion, which means it’s great for helping move the lymphatic system along, which can only be moved by gravity and muscle movement. The lymph system is responsible for waste removal, fluid balance, and helps the immune system. It also helps the blood passing through the veins of the lower body and limbs move back towards the heart. Shoulderstand will help to strengthen the upper body, including the shoulders and those muscles around the upper chest cavity that assist the diaphragm in breathing. This will help you to take a deeper breath and in doing so, will help your central nervous system to relax. It can also help relieve tension headaches due to tightness in the upper trapizius muscles. Of course, there are contraindications to doing this pose too. If you have a loose retina, unregulated high blood pressure, or herniated discs in the cervical spine, it is recommended not to do shoulderstand (but you can always do legs up the wall also known as Viparita Karani, which is a more restorative version of the pose that does not require any pressure around the neck). If you want to explore shoulderstand more deeply, I’m teaching Integrating Our Shoulderstand & Pranayama this Thursday evening at 7:30pm at Mala. Space is limited, so sign up in advance! When we decided to open a yoga studio we sat down and contemplated what was important to us, and community was number one on our list. We named the studio Mala, after the rosewood beads that we each wore (and still do) for so many years. We love the idea that the practice is the steady thread on which you place the beads of experience that comprise your lives. 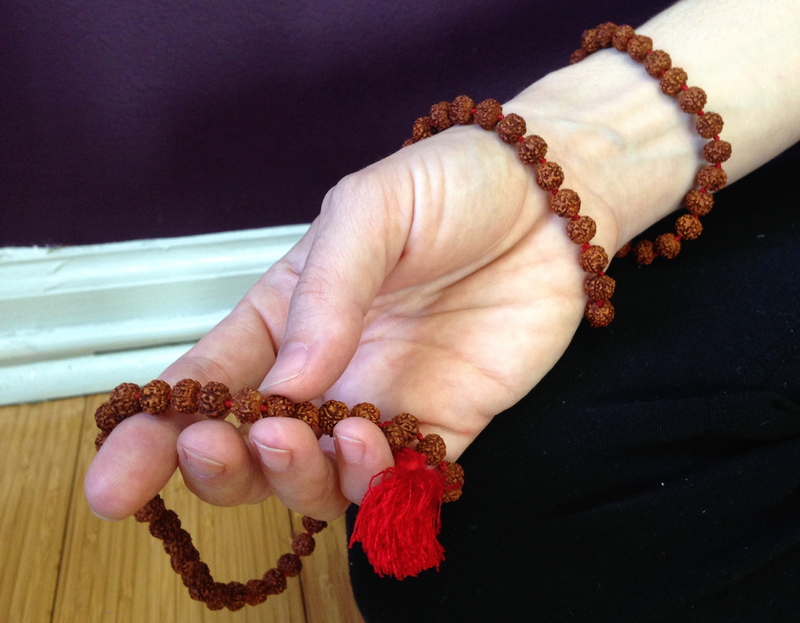 Malas represents the threading of each individual to the practice, and that although we each have our own sticky mat, we are connected to one another. Malas or japa malas are traditionally made out of rudraksha seeds, rosewood, or sandalwood, but can also be made out of gemstones. A typical mala is made up of 108 beads, or a smaller number divisible by 9. There are many reasons for the number 108 (read some of them here!). There are 108 earthly desires, 108 energy lines that converge to form the heart chakra, the number is divisible by both odd and even numbers, and more! We use our malas for meditation, and the longer you meditate with them the more power they absorb. When your malas break they say that you’ve worked through some karmic pain, so take it as a good sign! (And you can always restring them!). How do you use your mala beads? Let us know in the comments! I love spring – the promise of new beginnings, bright colors, and fresh scents. I like to take inspiration from the season and make my home crisp and clean, too. However, I tend to run into one big problem – a lot of cleaning products out there are full of chemicals we don’t want in our homes. So where does that leave us? How do we keep our homes clean and smelling fresh without using toxic chemicals? The answer? Essential oils! I love using essential oils to help disinfect my home and keep it smelling good. Essential oils are very concentrated so you should dilute them with white vinegar or water, and keep them out of reach of children. If you are pregnant or nursing, check to see if any of the oils you want to use are contraindicated. 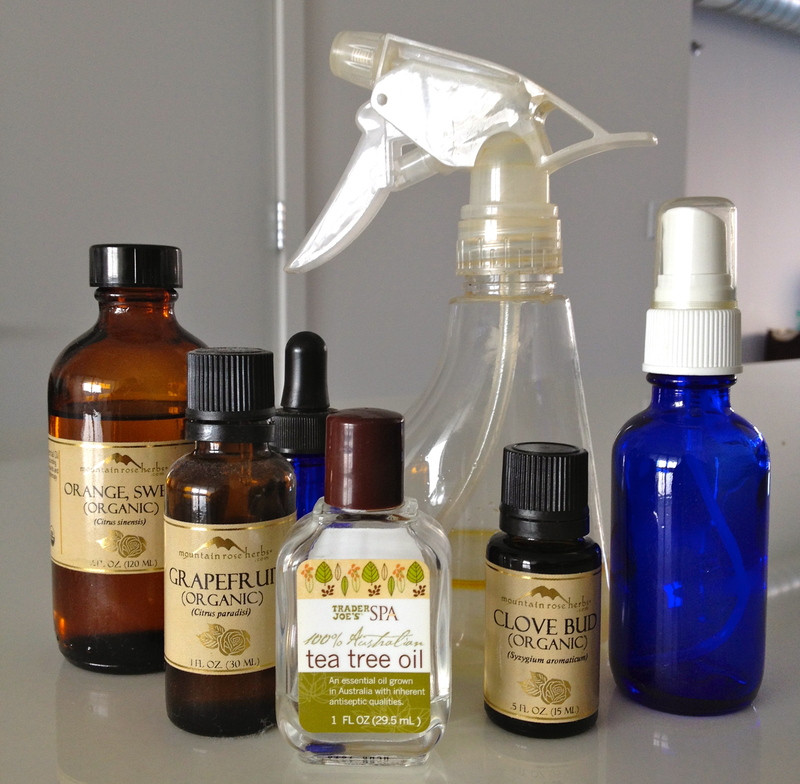 Some essential oils can strip varnish off furniture and lemon can bleach surfaces. Always do a small test spot first! As with anything you try for the first time, try small batches to make sure there are no allergies or reactions to any of the oils. This one is great for the bathroom where mold can build fast! Also, If you find the tea tree oil to be too strong for your nose, add in a few drops of a citrus. Do you have another favorite natural cleaner? Let us know in the comments! 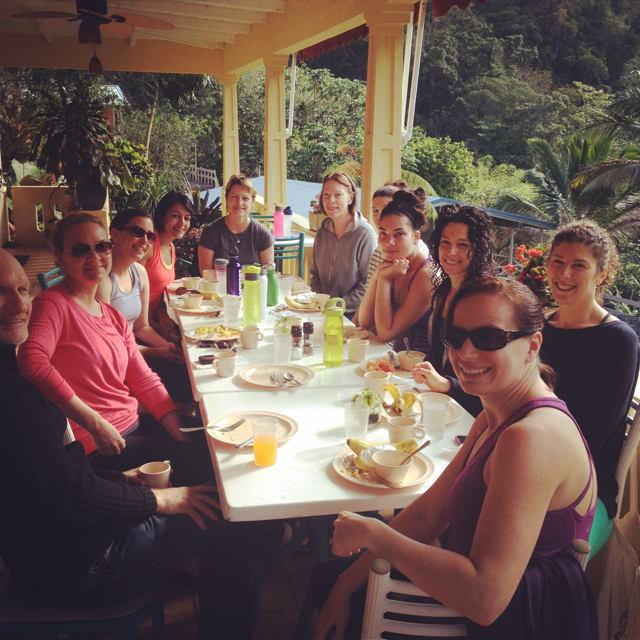 We are back from a wonderful retreat at Casa Grande in Puerto Rico, and are so grateful to the amazing yogis who shared their practices with us over those magical four days! Lauren Ginsberg wrote this beautiful piece about her first day with us, and we wanted to share it with you. Thanks, Lauren! 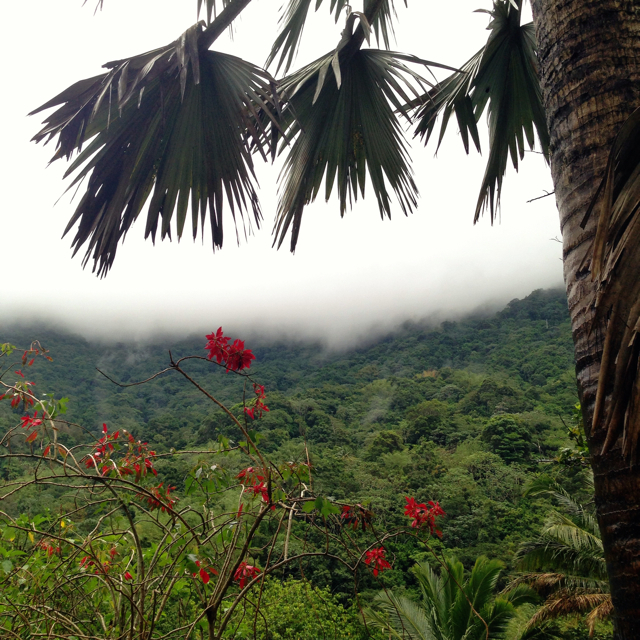 We are on our mats but instead of car horns we are listening to birds, roosters and intermittent rain as Steph prepares us for an intensive and relaxing few days together and alone on this amazing retreat in the mountain rainforest of Puerto Rico. We settle into our first afternoon with a perfect post-travel practice followed by wonderful food and getting to know new friends – including Jose who grows some of the root vegetables he includes in his dishes. Following a deep sleep we begin our day with a delicious coconut cornmeal polenta, fruit and amazing coffee. Digest and repeat, we are back on our mat. Steph invites us to reflect on our practice, to consider the through line which connects our practice from the mat to our everyday lives. Through standing and balance poses we direct our attention to our jumping jack muscles. Those glutes we are often overworking help us develop the stability in our pelvis and hips which support our spines. My ah-ha moment. While true life is always changing, there are certain periods of greater change which call for a different attention. My own recent experiences of such change have left me at times unbalanced and uncentered. So here in the gorgeous green landscape I am fortunate for the opportunity to pause and find my jumping jack muscles…and some stability from mat to life and from mountains to city. The beginning of a wonderful weekend.